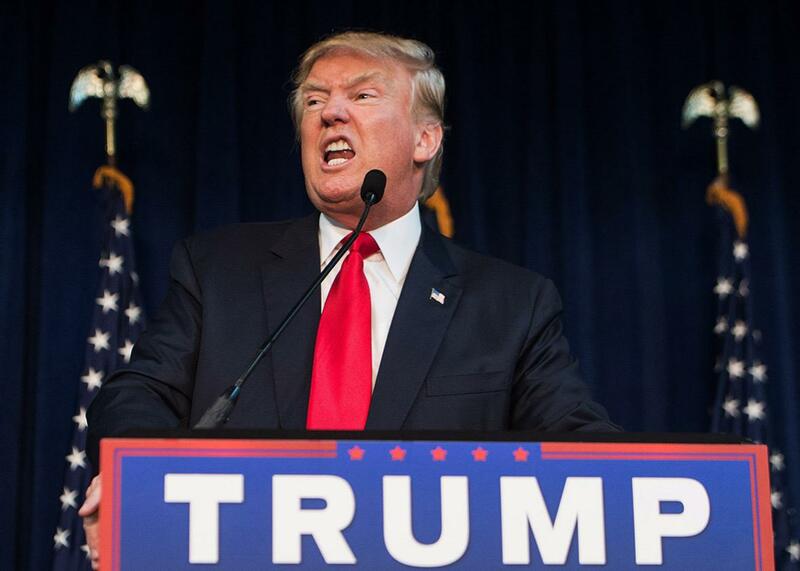 Frank Gaffney: The wind beneath Donald Trump’s Islamophobia. Frank Gaffney and his anti-Muslim cohorts laid the groundwork for Trump’s rise. Republican presidential candidate Donald Trump addresses a campaign rally in Manassas, Virginia, on Dec. 2, 2015. In the past couple of years, the political influence of Frank Gaffney, who the Southern Poverty Law Center describes as “one of America’s most notorious Islamophobes,” appeared to be on the wane. In 2011, he was banned from the Conservative Political Action Conference after claiming that the Muslim Brotherhood had infiltrated the group organizing the event. The next year, Gaffney, who was advising Michele Bachmann on foreign policy, concocted a theory that the Muslim Brotherhood had penetrated the State Department via Huma Abedin, Hillary Clinton’s aide. When five members of Congress, including Bachmann, asked for an investigation of the conspiracy, leaders of the Republican Party, including then–House Speaker John Boehner, forcefully rebuked them. (Soon Bachmann would leave Congress, depriving Gaffney of an important political collaborator.) The most recent Republican nominee for president, Mitt Romney, largely refused to countenance Gaffney-style anti-Sharia conspiracy theories. Chris Christie smacked them down as well. Despite the efforts of Gaffney and his allies, “Islamophobia was the dog that didn’t bark in the 2012 election,” says Matthew Duss, president of the Foundation for Middle East Peace and Slate contributor. “But the rise of ISIS and all these spectacular, graphic attacks did what they’re designed to do, which is to provoke fear and to provoke hysteria and create fertile ground for these kind of wild claims about the Islamic threat.” It has given Gaffney, and the network of anti-Islam groups of which he is a central part, a new level of power and relevance. The most tangible example of that is Donald Trump’s call for a ban on Muslim immigration, which he justified by citing figures from Gaffney’s think tank, the Center for Security Policy, about the supposed jihadist sympathies of American Muslims. (Gaffney called for a “moratorium on refugees and Muslim colonization” in September.) But Trump isn’t the only Republican candidate parroting Gaffney’s views. Ted Cruz has also been close to Gaffney; both Trump and Cruz spoke at an August rally against Obama’s Iran deal that was co-sponsored by Gaffney’s group. These relationships work reciprocally. Trump and Cruz may give anti-Islam conspiracy theories new prominence, but the anti-Islam lobby prepared the ground for the rise of both politicians. According to the Center for American Progress, this lobby—which also includes ACT! for America, the Middle East Forum, and Stop Islamization of America, among others—spent $42.6 million between 2001 and 2009 to support the spread of anti-Muslim ideas and rhetoric. “The efforts of a small cadre of funders and misinformation experts were amplified by an echo chamber of the religious right, conservative media, grassroots organizations, and politicians who sought to introduce a fringe perspective on American Muslims into the public discourse,” CAP reported. These groups’ activities correspond to growing local anti-Muslim sentiment, over and above the backlash created by 9/11. “In my book I use big-data analysis to track the number of news stories about mosque controversies in local newspapers,” Bail tells me. He found that the combination of violent attacks on mosques and political attempts to stop their construction increased almost 800 percent between 2005 and 2012. “With the surging power of this anti-Muslim narrative in the media, combined with everything ISIS says and does, it’s entirely understandable how there can be a sea change in American opinion towards Muslims,” he says. This sea change helped prime conservative voters for figures like Trump and Cruz. When Trump says darkly that Obama won’t call out radical Islamic terrorism because there’s “something going on with him that we don’t know about,” a good part of his audience knows he’s alluding to theories, promulgated by Gaffney and others, about Obama’s Islamist sympathies. When Cruz says that only Christian refugees from Syria should be allowed in the United States, he’s speaking to people who have likely heard about a Muslim plot to use refugee resettlement to wage “jihad via colonization.” “People see a very coherent narrative, backed by pseudo-experts and a sophisticated media infrastructure,” says Bail. Tuesday, Public Policy Polling released the results of a survey of North Carolina voters, summing them up this way: “Trump’s Islamophobia is a central feature of his appeal to his supporters.” It found that Trump’s support among the state’s Republicans is as high as it’s ever been, at 33 percent. Of those supporters, 67 percent want to create a national database of Muslims in America. Only 24 percent think Islam should even be legal in the United States. The poll also had good news for Cruz, finding him the candidate with the most momentum in the state. A majority of his supporters, like Trump’s, want to shut down mosques and believe that thousands of Arabs in New Jersey cheered 9/11. It should surprise no one that Cruz has hesitated to condemn Trump’s immigration plan. Both men know what their voters believe, and why they believe it.